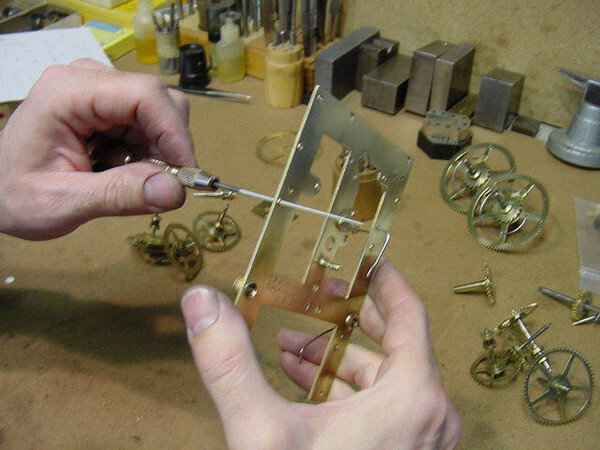 Below is a description of the many steps involved in the restoration of an antique American clock movement. For the most part the same steps will apply to almost any type of clock. 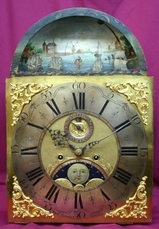 I chose this clock movement as an example because it is the most common movement that most repair shops will encounter. All repairmen will clean and bush the clock mechanism, but many of them will leave out some of the finer details necessary for a proper repair. Leaving out these details allow them to charge less but leaves you with an inferior repair. Although this is by no means a complete step-by-step description, we have included the most critical points. To avoid making this too long we have not included pictures of every small detail. 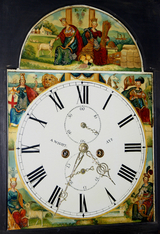 If we have overhauled a clock for you in the past, you might find it interesting to know how much effort went into your repair. 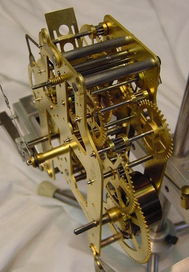 If you are considering having a clock movement overhauled this will give you a good understanding of what will be done if we perform the work for you. If you are having it done somewhere else, you might use this information to make sure that you are receiving your money's worth. This is what the clock mechanism looked like when it was removed from the customer's clock case. 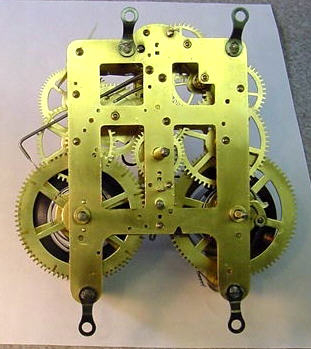 Since I have overhauled many of these clocks it is not necessary to draw a complete diagram of the movement but it is necessary to note the areas on paper which will require a bushing. The dots indicate the bearing surfaces. The arrows indicate those bearing surfaces which are worn badly. The direction the arrow points is an aid to help me maintain the bearing surfaces original center when installing the bushing. If this is not done the gearing will not align and mesh at a proper depth for most efficient operation and may even cause the clock to fail. The curls at the bottom indicate the direction of coil for the mainsprings. I show this drawing because many repairmen will scratch these notes directly on to the clock permanently marring the surface. The small amount of extra effort this requires is worthwhile because it helps to preserve the plates. 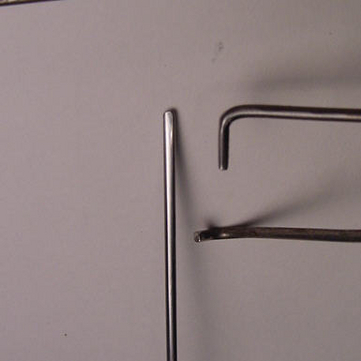 After releasing the wound mainsprings using a let down key and mainspring clamps the clock is disassembled. Not including the nuts that hold the movement together there are 26 parts which make up the clock movement. Each of these parts will receive special attention before the job is complete. A quick examination of each part is made looking for bent teeth or arbors, badly worn pinions etc. The parts are then put into a wire mesh basket and submerged into the ultrasonic cleaning tank. 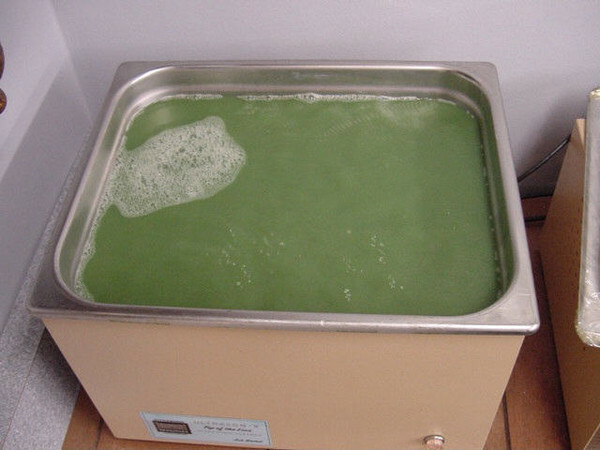 This picture below shows the ultrasonic cleaning machine with the lid off. It is difficult to see here but the chemical degreaser is being agitated by ultrasonic sound waves. This process is called cavitation. The sound waves create millions of tiny bubbles which implode on the surfaces of the pieces being cleaned. These implosions "scrub" the pieces as they sit in the degreaser. After the parts are cleaned, they are rinsed with a drying agent and then hand dried. At this point I like to buff the parts on this buffing machine using a fine wire buffing wheel. Although this step is not mechanically necessary, it gives the finished movement a much brighter, cleaner appearance. The picture below shows the right side of the clock's count wheel after buffing and the left side before buffing. 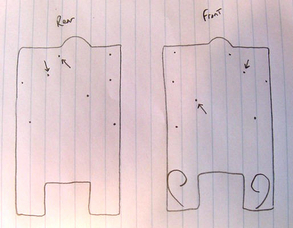 Before I show you actual pivots I thought it might be helpful to show a drawing of what you will see in the next frame. The pivot drawing in the middle illustrates what a pivot should look like. The sides are perfectly flat. The drawings above and below show deep ruts or grooves worn into the pivot surface. These pictures are extreme cases of badly worn pivots. Most of the pivots in a clock will not be this bad although almost all will still need some refinishing. Not only do the bearing surfaces wear but the pivots that turn in them also wear. Therefore it is necessary to refinish both the bearing surface and the pivot. 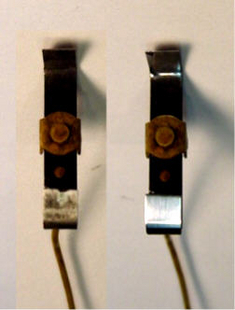 The single picture below shows three pictures of the very same pivot in various stages of the refinishing process. The first picture shows the badly worn pivot. As dirt mixes in with the oil the dirt acts as an abrasive, cutting into the pivot surface like a file. 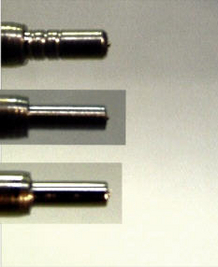 The middle picture shows the same pivot after being smoothed with a fine file. The ruts have been removed and the sides are now straight. Most clockmakers will further smooth the pivot with emery buffs and then stop there. Although this further smooths the surface there is a tendency for small amounts of the emery buff's abrasive particles to embed themselves into the surface of the steel pivot. If this occurs it will cause the new bearing surface to wear prematurely. The bottom picture shows a properly restored pivot. Note how shiny the apppearance is compared to the rather frosted look of the pivot above. This is accomplished without the use of emery buffs, abrasives or polishing compounds of any kind. It is done with the help of a tool called a burnisher which is a finely finished, perfectly smooth piece of high quality steel in the shape of a file. The next step describes this process in more detail. This picture shows how the above work was performed. The gear is mounted in the lathe and spun at high speed. As the pivot rotates a very fine file called a pivot file is pressed up against it and moved back and forth until all of the scarring is removed. Next another "file" is used. This file has no real teeth. The surface of the "file" is prepared by stroking it sideways across a piece of 120 grit sandpaper. This creates a very fine file like surface used to further smooth the surface of the pivot. This is what is being used in the picture. The last step involves the use of the burnisher. It is a piece of steel like the one in the picture but is finished with up to 2000 grit sandpaper which creates a very smooth shiny surface. This surface is so smooth it does not cut against the surface of the pivot like the two previous steps but instead compresses the outer surface of the steel pivot making any fine scratches disappear. One of the main reasons we overhaul a clock is because of worn bearing surfaces. The picture above shows a before and after of the same bearing surface. The left photo shows a worn bearing and the right shows the same bearing after a bushing was installed. If you look closely at the one on the left you can see that the hole is not round but egg shaped. 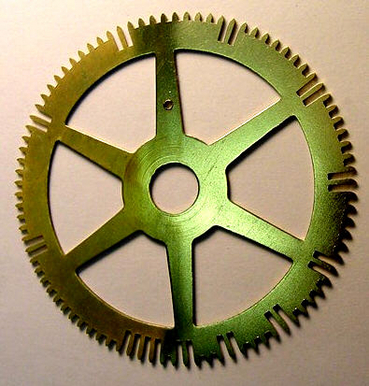 This egg shaped hole changes the center distance of the gear’s arbor which in turn changes the depth. This error in depth can create additional drag on the gear train and will cause the clock to not function efficiently. The new surface on the right is perfectly round. Bushings are small "donut" shaped pieces of metal made of brass or bronze, which are used to replace the metal in the badly worn areas. In order to install a bushing a series of reamers are used to open up the worn hole, being careful to maintain its original center, and then the bushing is tightly pressed into the hole creating a bearing surface that is normally smaller than necessary. This small hole will be opened up to the proper size later. This is another picture (above) showing a repaired bearing surface. 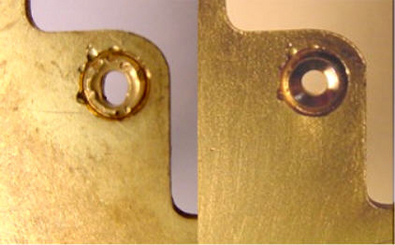 The picture on the left not only shows a worn bearing surface but also shows an amateur attempt at repairing the wear. Looking closely you can see tiny punch marks around the outside of the hole. A "repairman" actually punched around the outside of the bearing surface with a prick punch trying to close the hole. This is an extremely poor method and has been used more often than you might imagine. The picture on the right shows the same area with a bushing installed. Unfortunately, some of the prick marks are still visible even after the new bushing was installed. The worn holes or bearing surfaces have been repaired but now they are too small. The next step is to make them the correct size and fit for the pivot that will turn inside it. This is shown in the photo below and is done with a tool called a broach. This tool is a tapered, five sided cutting instrument. By turning it inside the hole I am able to slowly enlarge the hole until the pivot fits perfectly. 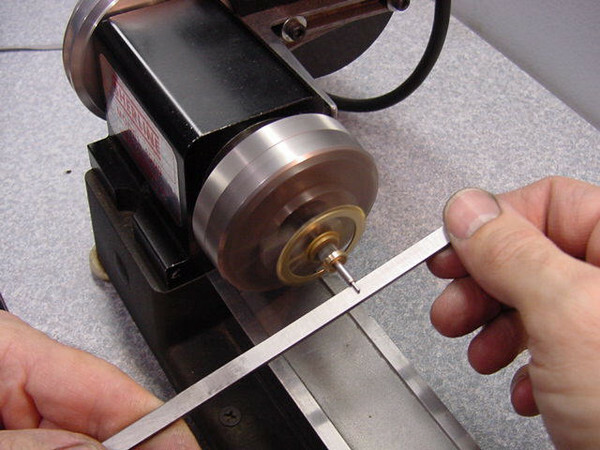 The rear of each bearing surface is then chamfered, meaning the sharp edge left by the cutting tool is removed. The same tool is then used to cut fresh oil sinks on the outside of the plate. 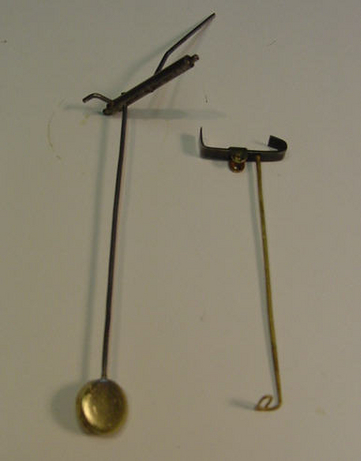 After this is done another tool, called a smoothing broach is used. It is very similar to the other one only it is round (not five sided) and the sides are smooth. This broach, with a light coating of oil, is pushed hard into the newly cut bearing surface and rotated in the hole. 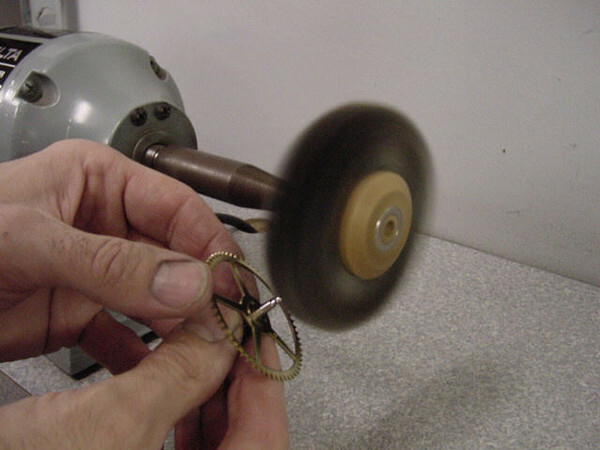 This action, similar to the burnishing of the clock pivot mentioned earlier, both smooths and hardens the working surface of the bearing improving durability. This is a step that many repairmen leave out when overhauling a clock. Once these steps are taken for each and every bearing surface each gear train is put in place between the clock plates and spun to check for smoothness of motion. Each gear is also checked for what is called proper end and side shake as well as depthing. 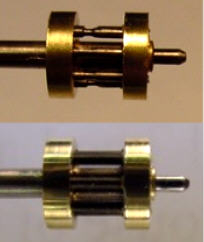 The picture below is a before and after photo of what are called lantern pinions. 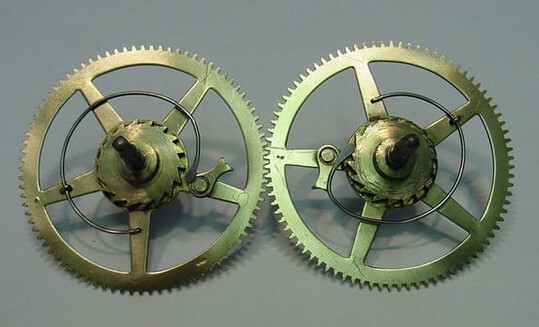 These pinions are driven by the brass teeth on the clock gears. 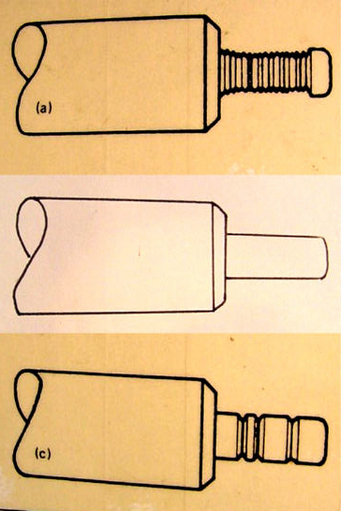 The top picture clearly shows ruts worn into the pinion surfaces. The bottom picture is part of the same gear but with new pinions installed and the brass shrouds polished. 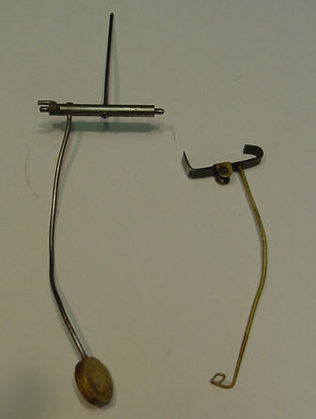 This might be hard to see but the in the picture below the vertical lever on right is worn on its tip and the horizontal lever with the 90 degree bend on the top left side has a rut worn across its surface on the part that is pointing down. Same levers with the worn spots polished out. Leaving worn spots on levers can cause intermittent failure. Much of the overhaul work I see done by other repairmen ignore these worn lever surfaces. The picture above is a side by side comparison of the same set of pallets. The one on the left, before polishing, and the one on the right, after. If you look closely at the one on left (at the bottom) you should be able to detect a rut worn vertically across the center of the pallet face. 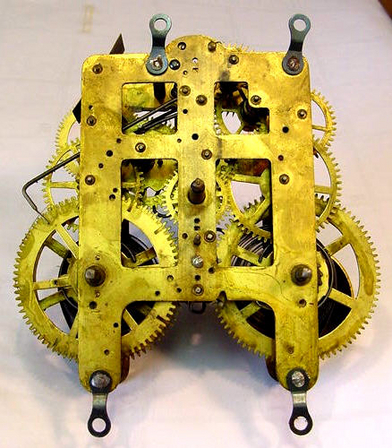 The pallets and the escape wheel work together to make up a part of the clock called the escapement. 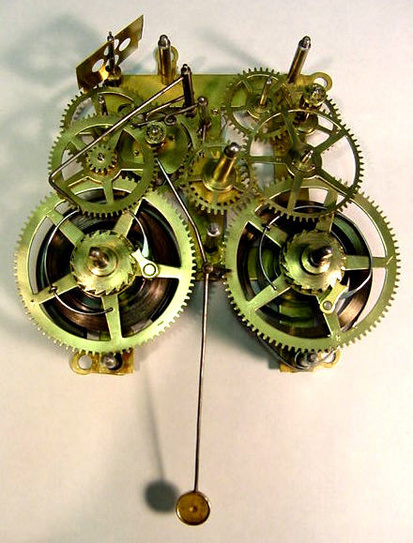 The escapement is the heart of the clock and not only divides time by allowing only one tooth at a time to “escape” but also creates the power or impulse that pushes the pendulum back and forth. This is where the "tic-toc" sound comes from. These surfaces are impacted thousands of times a day by the brass teeth of the escape wheel. Dirt which embeds itself in the surface of the teeth eventually cuts into the pallet surface like a file. 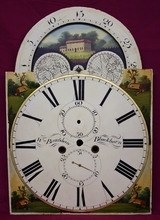 Wear like this takes many, many years to occur but is very common on antique clocks. The wear must be ground out and then polished. This is accomplished with a series of emery boards of different grits in a way that removes the least amount of metal and maintains the original angles. If too much metal is removed or the angles changed the pallets must be reshaped or bent in order for them to be adjusted properly once they are put back on the clock. This process of resetting an escapement is little understood my many who claim to be able to repair clocks but is vital to its proper operation. This shows a hammer lever on right and a different view of the pallets discussed in the last section on the left. I prefer to straighten these levers as they have often been bent out of shape many times in the past by previous repairmen. Although this will not be their final state when installed in the clock, it gives me a fresh place to start when bending them into a proper working position. These are the mainwheels (below) that carry the mainsprings to power the clock. 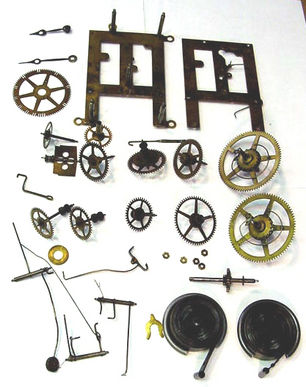 These gears contain the ratcheting system which holds the spring wound when the winding key is turned. The ratchet wheel (looks like a circular saw blade) in the center must be checked too see that none of the teeth are damaged and the clicks must be checked to see that their surfaces are still sound in order to engage the ratchet teeth properly. If not worn too badly the acting surfaces of the clicks can be filed smooth and the rivets checked for proper tightness. If the click is worn too badly it must be replaced. 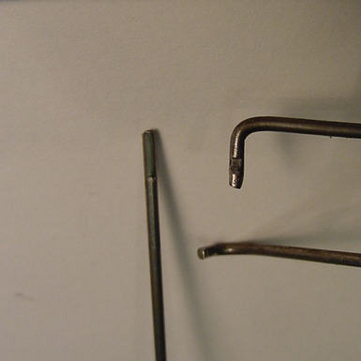 After this is accomplished the click springs, the "c" shaped wire that you see, is adjusted to apply the proper pressure against the click to push it into the ratchet teeth. The mainspring on the top is an old weakened mainspring. A mainspring like this is considered "set". If we put this mainspring back in the clock we run the risk of the clock not operating a full week on one winding. 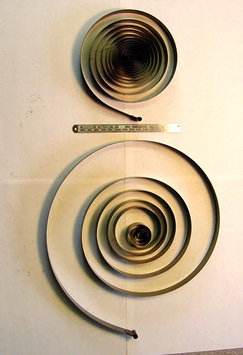 For comparison, the mainspring on the bottom shows a new one of same strength and length. Because it is not "set" it expands into a much larger diameter. Prior to assembly the clock plates are often re-cleaned and each pivot hand wiped and examined to be sure there is no contamination. This is a picture of a freshly overhauled clock mechanism just before the top plate is installed. 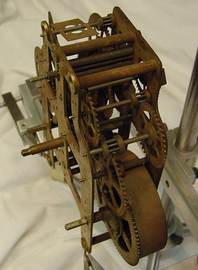 After the top plate is set in position and all the pivots fed into the fresh bearing surfaces the striking gear train must be properly synchronized and the levers and escapement properly adjusted. The clock is then oiled, wound up and hand tested at the bench before installing in case. The clock is then tested for a week in order to determine that it will run and strike for a full week's duration. During this time the clock is also regulated to assure proper timekeeping. In case you forgot what this clock looked like before the restoration here is a reminder below. Here is another set of before and after pictures of a Seth Thomas time and strike movement we restored. Note the extreme amount of rust in the picture on the left. 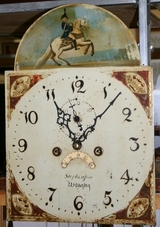 If you would like new life restored to your old worn out clock give us a call! See our Before and After pages for more dramatic pictures of movement, dial and case restorations.